Ethan Carter III participated in his last set of Impact television tapings last night and was written out of television completely as he has opted not to renew his Impact deal. 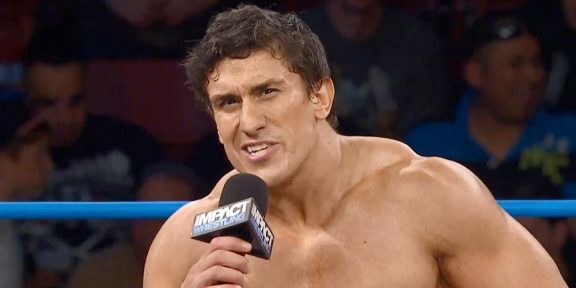 By the time Impact tapes another set of tapings, EC3’s contract would have run out so there was no other option but to write him out during these tapings of Impact. What’s interesting is that EC3 posted a photo on his Twitter wearing an Adidas trousers, capitalizing each letter of the word that reads “All Day I Dream About Sportsentertainment.” It’s been reported before that EC3 is on his way back to WWE or NXT and his sports entertainment remark was very obvious to what he was referring to. Before joining TNA, the 34-year-old spent a total of 10 years in WWE’s developmental system and NXT. He wrestled under the name of Derrick Bateman before he was released in 2013. His time at Impact Wrestling was effective, and he went from being just a developmental guy in WWE to one of the main eventers of the company. He is a former TNA champion, a title he won twice, and Impact Grand champion.